Though the hassle with the extra Tamron adaptall-2 P/KA adapter to mount, I like quality of many of the adaptall-2 SP zoom lens and primes. One cheapo zoom that that I like to share with you is Tamron 75-250mm f/3.8-4.5 adaptall-2 104A. It is not a relatively small lens if you consider the extra reach 250mm. 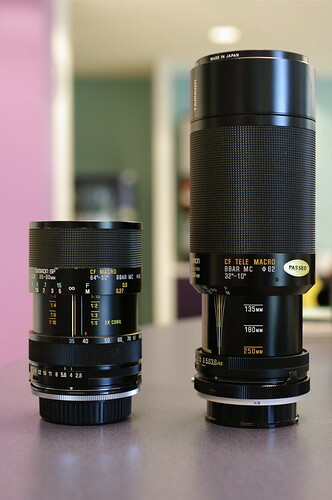 And in terms of weight, it is very similar and perhaps lighter when compared to other 70-210mm zooms. Filter size is 62mm and it is easy to hand-hold the lens. The zoom starts out at 250mm end and zoom to 75mm and I like it starting at a zoom position that I use more often. Bokeh is quite decent with the zoom. Internal lens hood is nice but not deep enough to be effective. Works well with Tamron adaptall-2 PK/A adapter but I observe more PF/CA in the long end when 01F 2x TC is mounted.